4 Posibly Causes Black Smoke From Car Exhaust and How to Fix it ? Black Smoke from exhaust Cars – Did you know, that our car produce power from transmitting heat to rotary power. Heat created by combustion, and combustion produce several toxic emission. The emisson should be transparent, because it just produce CO (carbon monoxide) but what hapenned if the smoke color is black, what causes smoke out fromcar exhaust ? we will find the answer below article. If we examine, this smoke is not too disturbing for us who drive a car inside the cabin. But for other road users , especially pedestrian this is quite disturbing, the black smoke mean that the exhaust gas containing several toxic gas like NOx. The NOx is a badly exhaust gas resulting from in-perfectly combustion. On a normal combustion should resulting CO and H2O. The NOx could be a toxic to our body if we inhale the gas. For that reason, as the owner of the car we must usually pay attention to vehicle fumes. Do not let the smoke from the exhaust is white or black. Indeed, for cars production over the year 2010 the majority already carries the EURO 3 emission standard but, the standard is set at normal engine conditions. If there is a problem with the engine the resulting emissions could be more severe, in some countries there are even sanctions for car owners who are smoky. As we discussed to above, the black smoke on the car is due to improper combustion or in other language is incomplete combustion. What causes incomplete combustion? In the combustion engine, we recognize the ratio of AFM (Air Fuel Mixture) on petrol engines, generally this ratio is around 14: 1 or 14 air molecules compared to one molecule of gasoline. If the ratio changes at 16: 1 or more then it is a lean mix. But if this comparison is 12: 1 or below it has entered too rich or wasteful mixture. Rich mixture could hapenned because petrol is not fully mixed with air molecules, so that when the spark plugs sparking it can burn gradually and not spontaneously. This is what makes the vehicle smoke smells of gasoline even feels painful in the eyes. If too much gasoline is burned in the combustion chamber then consequently the smoke of the vehicle will be much more concentrated. In this case, you should suspect the carburetor for first. It will determine the ratio of air and gasoline. If this black smoke occurs when idle RPM, then it is due to idle air mixture settings that are less precise. The solution you need to make the adjustment by turning this screw to the left or right to meet the ideal result. Check the choke valve, if it is still covered it will make the gasoline too rich. If this problem occurs when high RPM or when accelerating it may be caused by damage to the main jet inside the carburetor. The main jet is located inside carb then you have to replace a carburetor unit to eliminate this problem. If the black smoke only appears when the car is climbing or carrying heavy loads, then it is the result of a power system on the carburetor that will supply more gasoline thus making AFM richer. For this problem is normal. Basically this is the same as the above problem, but the above problem occurs in a conventional car with carburetor fuel system. For the second cause occurs in MPV and Hatch class cars are widely used by costumer in year 2000 and above. The problem is equally related to AFM ratio. However, fuel mixing on the EFI engine does not occur on the carburetor, the engine use the injectors to inject a certain amount of gasoline into the intake manifold. So the mixture of gasoline and air occurs directly on the intake before entering combustion chamber. In this case, the volume of injected gasoline is influenced by commands from the ECM as the brain of EFI system. In doing the calculations, ECM uses several sensors to determine the various conditions of the engine. Data from various sensors will be processed to obtain the required volume of petrol under these conditions. From the above, we can see that the success of the injection system is influenced by the accuracy of sensor readings, the accuracy of ECM analysis and the condition of Actuator / Injector. If one of the three components is malfunctioning then the Efi system will erupt and the result can make the petrol mix too rich. A rich mixture will occur if the MAF, IAT and MAP sensors are damaged. This will make the car smoking on every RPM. Beside the sensor, ECM damage may occur and determine rich fuel mixture. But if this happens not only smoke problem but the entire engine system will eror even the engine broke down. The broken injectors can be a next problem, if the injector keep on or can not closed, the gasoline will alwasy flowing even the ECM command is off. So that the mixture can be very wasteful. So how to know if there is damage to the EFI system? 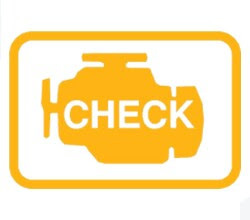 When there is damage to the sensor or injector, the check engine usually light up. If we scan it, it will show the location of the sensor / actuator that is damaged. But if you do not have this scan tool, it will be difficult because there are so many sensors on Efi engine. For that would be nice to take your car to the official repair shop for chek-up. Generally if there is a problem with the EFI system, the right solution is a component replacement. If your car smoke only occurs on idle RPM but your car is using injection technology and check engine lights are not iluminate. Then it could happen to the idle speed control or idle air control. IAC is a door that use by air to flow to the intake manifold when the throtle is normaly closed, this valve will regulate the air passing through the idle channel inside the throtle body. So the mechanism when the gas valve is closed, then the air flows through the idle port and directly into the intake manifold. But before going out into the intake there is a valve that regulates the size of this idle channel. If the valve opens full then the channel will open wide the result of a lot of air coming into the intake, but if the valve is open slightly then the idle channel will be narrower so that the air supply will be restrained. If the supply of air is restrained, while gasoline is supplied with the same volume then this will lead to a rich mixture that has the potential to produce concentrated exhaust emissions. Generally if this problem arises, there are other engine symptoms that follow such a difficult engine start even suddenly Off when idle RPM. The solution, you need to open the IAC located on the throtle body. Then clean the valve and clean the idle channel using the Carb cleraner, this fluid will remove the crust and dirt on these two components quickly. For the last cause of the air quality supplied from the filter. The filter has a function to clean the air from dirt, lest it pollute the air into the intake and inhibit intake airflow. Filter work by blocking the particle on a outer surface of filter, in a long time used the particle will settles and there are two posibly causes. First, the settles particle will be resistance to the air hose so the air flow will hamperred. The second cause, filter element will broken down so the dort air will flow inside the air induction. If there are dirt or dust inside the air induction, then it will clog several important port in the air induction inlcuding idle port and injector chanel. Indeed the filter does not directly make the car smoke so black but dirty air filter will be the initial cause that make several damages for example on MAF, IAT and MAP sensors located along the air induction hose. Dust or dirt attached to the sensor surface will obviously affect the accuracy of sensor readings. The best solution of this problem is the prevention of damage to the injection system on the engine, ie by tuning up the engine on a regular basis. Most importantly, keep clean the air filters regularly and if filter conditions are not possible to clean then you should replace them with new ones. Cleaning the engine combustion is also not less important, this cleaning you can do yourself with the material combustion chamber or do it your trusty workshops. Similarly a brief article on the causes and how to fix or resolve black smoke that out from car exhaust, hopefully add to our insight and useful for all of us. Don’t forget to share so that more and more people knowing about the insight.